On October 19, 2017, astronomers witnessed the first known interstellar asteroid—a bizarre, cigar-shaped rock that, just as quickly as it entered into our Solar System, exited in a hurry. 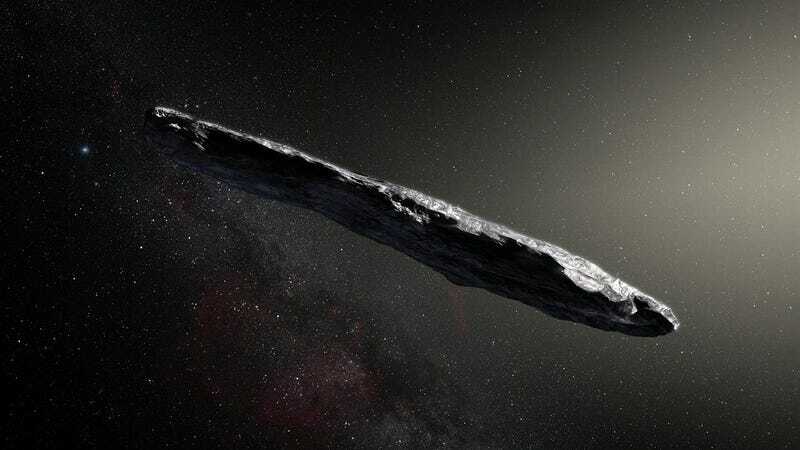 Not satisfied that ‘Oumuamua, as it’s been named, is just an odd asteroid, astronomers from Breakthrough Listen recently tuned their Green Bank telescope into the object to see if it’s an alien spaceship or some kind of probe. The preliminary results are now in and—brace yourself—it’s still a rock. Typically, scientists at Breakthrough Listen hunt for aliens by scanning distant stars, but when ‘Oumuamua (pronounced “oh-moo-ah-moo-ah” and meaning “a messenger from afar arriving first”) paid us an unexpected visit, it was an opportunity they couldn’t pass up. Indeed, astronomers have catalogued around 750,000 asteroids, yet this is the only known chunk of rock to originate from a different stellar neighborhood. What’s more, ‘Oumuamua’s strange shape and awesome speed (it’s moving at 26.3 km/s) hinted at something perhaps not quite natural. Using Breakthrough Listen’s backend instrument on the Robert C. Byrd Green Bank Telescope in West Virginia, the astronomers ran the first of four scans, or “blocks,” of observations from 3:45pm to 9:45pm ET on December 13. The asteroid, or alleged spaceship, was scanned across four radio bands, each of which corresponded to four radio receivers, denoted L, S, X, C, and spanning billions of individual channels from 1 to 12 GHz. During this first block of observations, the astronomers also collected 90 TB of data, which, unsurprisingly, they’re still parsing through. No artificial signals were detected within this first block of data. So depending on your opinion of aliens, this is either good or bad news (raises hand that this is good news). Siemion said the weather cooperated such that his team was able to get data at all four bands. At this stage, only data from the S-band receiver has been processed (between frequencies of 1.7 to 2.6 GHz), and analysis of the remaining three bands is still underway. This unexpected visit has the Breakthrough Listen team wondering if there are specific search techniques or algorithms that would be more effective when scanning nearby objects or hypothetical probes. This is completely new territory, but for now, Siemion’s team figures that ‘Oumuamua doesn’t emit “an isotropic narrow-band beacon at centimeter-wavelengths above a power of about 0.2W”—or the approximate power of an iPhone. Some might think this exercise is a complete waste of time, and a venture that skirts the bounds of credible science, but not everyone shares this viewpoint. Null results are part of science, and the question ‘Are we alone?’ is one of the most fundamental questions we have. Penn State astronomer Jason Wright agrees, but he didn’t think ‘Oumuamua was the greatest candidate to begin with. Wright said he’s not “particularly persuaded” by the SETI approach for this particular asteroid, but he understands why astronomers like Avi Loeb and Andrew Siemion are, and he’s “excited that Breakthrough Listen is including interstellar objects” in its campaign. Defending his work, Siemion says SETI is a key tool in attempting to answer the question of whether or not we’re alone in the universe, and that it’s a reasonable scientific endeavor to determine the number density and distribution of technologically capable life on both galactic and possibly cosmological scales.